by Schulz, Linda, Morris, Lisa R.
Schulz, Linda, Morris, Lisa R.
In >Creative Play Activities for Children With Disabilities> you will discover 250 games and activities designed to help infants to 8-year-olds with all types of disabilities grow through play. 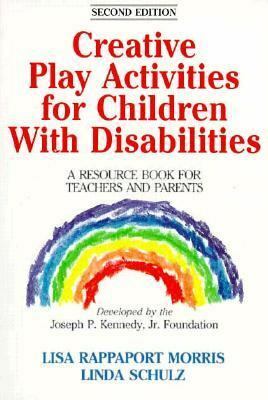 Many activities describe special adaptations for children with physical, visual, or hearing impairments.Developed in conjunction with the Joseph P. Kennedy, Jr. Foundation, these creative play activities will help confidence and self-esteem blossom as young children meet success in activities that are fun.>Creative Play Activities for Children With Disabilities> is the only book to address both the concerns of parents guiding their children's activities at home and issues faced by educators in program settings.Each chapter focuses on a particular world, or activity theme. Themes include exploring the world of the senses; active games with rolling, crawling, walking, and more; building and creating; imaginative outdoor fun and water play; music play; and group games and activities.Each activity lists detailed directions, needed equipment, the activity's benefits, and, where possible, adaptations for different disabilities.Schulz, Linda is the author of 'Creative Play Activities for Children With Disabilities A Resource Book for Teachers and Parents', published 1991 under ISBN 9780873229333 and ISBN 0873229339.